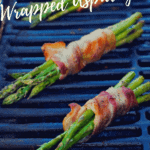 Grilled Bacon Wrapped Asparagus ~ Easy, Grilled Side Dish That is Paleo! 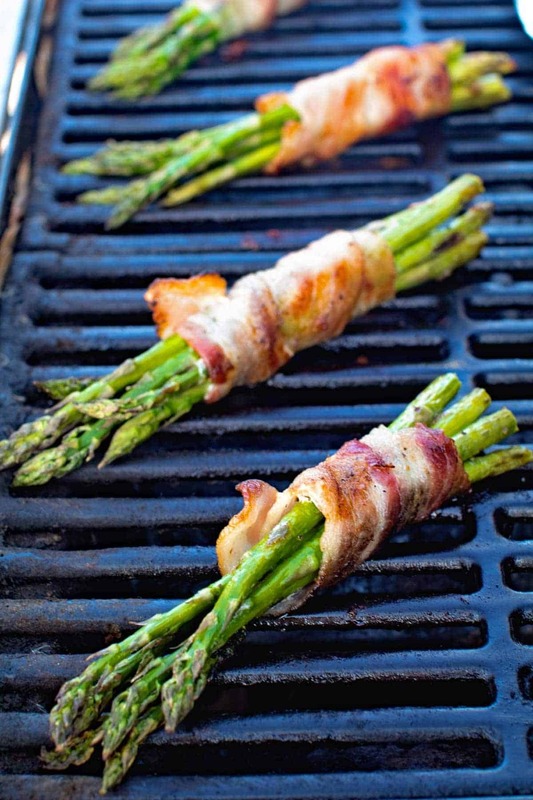 Crispy Bacon Wrapped Around Tender Asparagus Spears! You know what I always have troubles with? Finding a side dish to put on the grill along with the meat of our choice! Do you also struggle with this? Well, if you are like me then I’m please to inform you that I have solved your troubles! I mean it has BACON in it so obviously it’s a winner right? 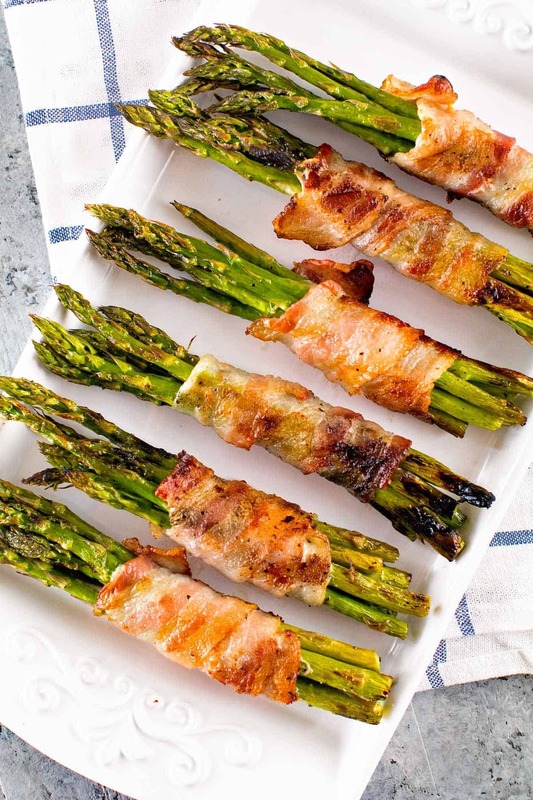 Tender pieces of asparagus wrapped in salty bacon. Mind blowing, honestly I can’t believe it took me that long to try this! Plus they take all of 10 minutes to prepare, throw them on the grill with your main dish and boom you have a meal! That’s how I like to roll my friends. Nice and easy, few ingredients, delicious eats. The first step to making Bacon Wrapped Asparagus is to preheat your grill to 350 degrees. Next you will trim the ends of your asparagus to each piece is about 5 to 6 inches long. Place asparagus in a mixing bowl and toss with olive oil to coat. Then season with salt and pepper. After that you will take 5-6 spears of asparagus and one slice of bacon. 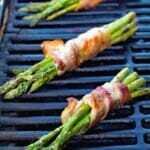 Wrap the bacon around the bundle of asparagus and secure with a toothpick if desired. Repeat until all the spears and bacon are used. Place the bundles on the preheated grill for 10 minutes then flip and grill an additional 10 minutes or until the bacon is crispy and asparagus is cooked through. When you grill are you one of those people that just throw the meat on or do you try and do your whole meal on the grill since you are out there anyways? I am the latter of these two. I figure if I’m grilling I might as well go all out, or maybe I should say the hubs should! We have a great team going on. I prep most of the items and then I send him on his way out to the grill, he babysits the grill and usually the kids outside while I clean up then he magically reappears with the food! This lady has it figure out don’t I? Outsource, outsource, outsource! The key to a happy life in my opinion! People also ask me how I get it all done in my life. 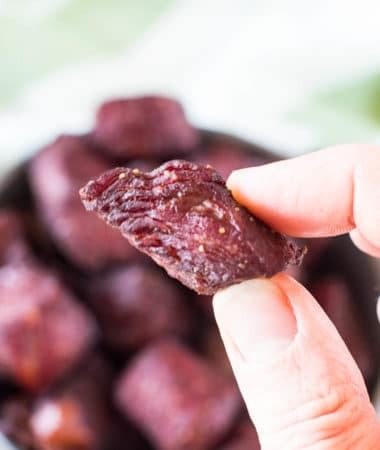 Blogging over at Julie’s Eats & Treats along with starting this baby blog all about grilling and smoking! My friends is I outsource. I hire help on the blog and I hire help in life. The kids go to daycare, no shame, I like to work and it makes me a happy Mom. They like daycare and get out of the house. I have a housekeeper. I’d rather work to pay her than clean my house. It’s just not something I enjoy! My husband has naughty words for me when I have to clean! 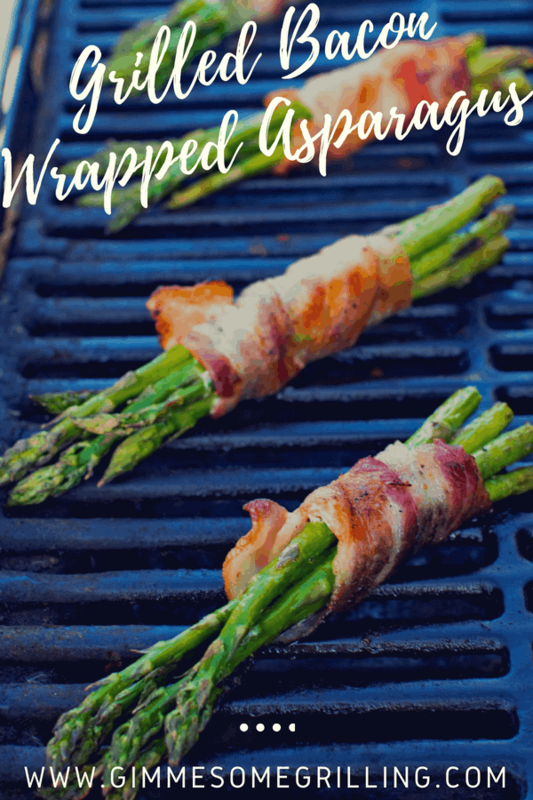 One thing I won’t outsource is eating these delicious Grilled Bacon Wrapped Asparagus Bundles! No way, I may or may not have ate three of them. Ok, fine. I totally ate three of them! 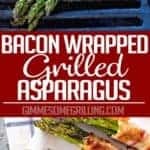 Tips for Making Grilled Bacon Wrapped Asparagus! Rotate bundles evenly to make sure they are cooked evenly. Add Cajun seasoning for a little kick. Watch grilling time closely, remove when they are cooked to your preference. Can I make Bacon Wrapped Asparagus in the Oven? Yes! 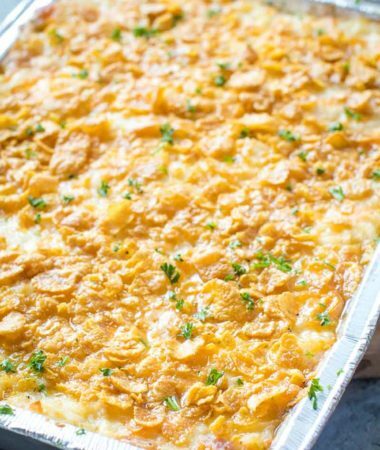 You sure can make this in the oven if you prefer not to grill and it’s so easy. If you would like to make these in the oven bake in preheated oven warmed to 400 degrees on a roasting pan for about 25-30 minutes. And honestly I would have ate ALL of them if the husband hadn’t been watching! He ruins all my fun sometimes. Plus, for some weird reason my kids adore asparagus. 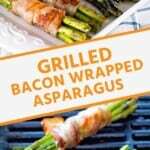 Love these Bacon Wrapped Asparagus? Then you’ll also love Grilled Bacon Wrapped Brussels Sprouts!!! I’m not arguing with them! 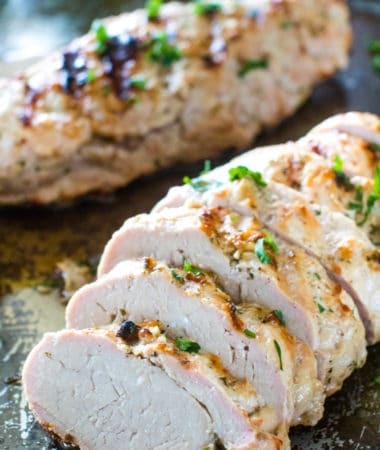 Are you ready to get grilling this chicken?!! I’m getting hungry again just looking at it! Be sure to tag me on Instagram @gimmesomegrilling or hashtag #gimmesomegrilling! I really want to hear from you, so if you love this chicken, be sure to comment and leave a five star rating below. Bacon Wrapped Asparagus is an easy, grilled or baked side dish that is paleo and gluten free! 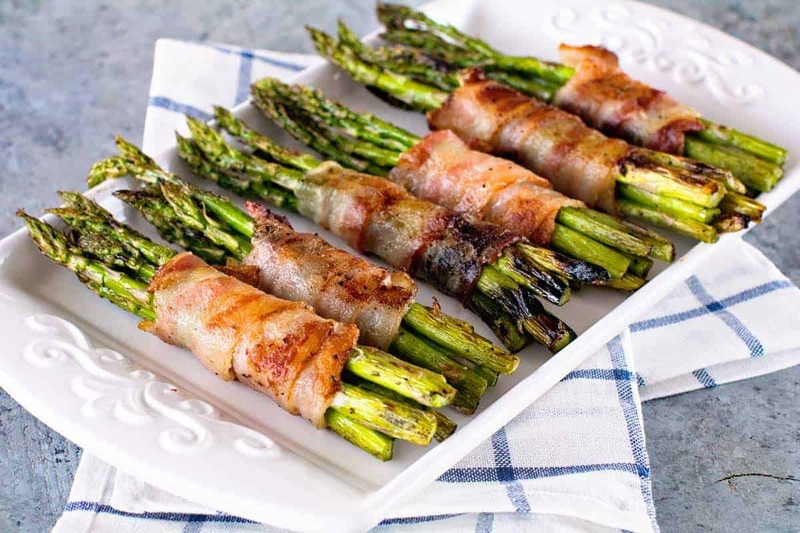 Tender asparagus spears wrapped with crispy bacon! Take 5-6 asparagus spears and one slice of bacon. Wrap bacon around the asparagus. Secure with toothpick if desired. Grill for 10 minutes. Flip and grill for an additional 10 minutes or until bacon is crispy and asparagus is cooked through.